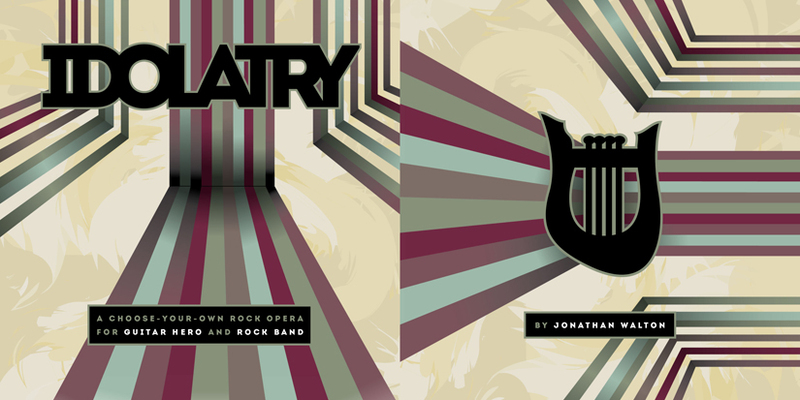 It can be frustrating to look for stuff on iStock, but sometimes you find the perfect piece, like the amazing background art I used in this “album cover” for Idolatry, which is an amazingly reminiscent of both 1970s prog-rock album covers and the endless-rainbow-guitar-neck interface of Guitar Hero and Rock Band (both originally designed by Harmonix). The lyre/axe graphic on the back is a salute to the original rock messiah, Orpheus. This entry was posted on	November 4, 2012 at 12:20 am	and is filed under Idolatry.